This is a transcript of my talk to 800 designers and product managers at the Front Conference in Salt Lake City, Utah in May of 2018. My comments have been lightly edited by Front for readability and clarity (Read: We removed the um’s and like’s). Hello. Hi! 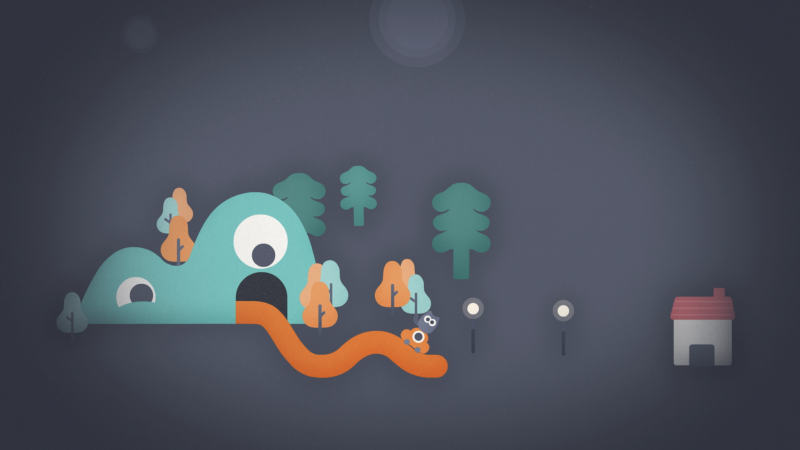 I’m Vicki and I’m a product designer at Headspace. I’m so excited to be here. I’m a little nervous, so just please play along if I ask you any questions. 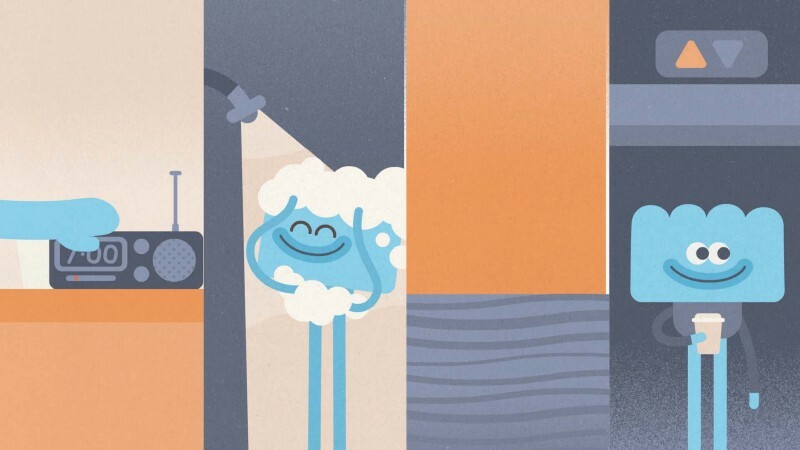 A quick show of hands — how many of you have heard of Headspace? Wow! That’s a lot. I wasn’t expecting that many. And who here has meditated before? It doesn’t have to be with Headspace. Okay, so maybe half as many. But that’s not what meditation is! As I understand it, meditation is just about being aware of your thoughts. You’re not trying to turn them off. You’re not trying to have any feelings. Those are totally okay. You’re just trying to observe them without judgment. 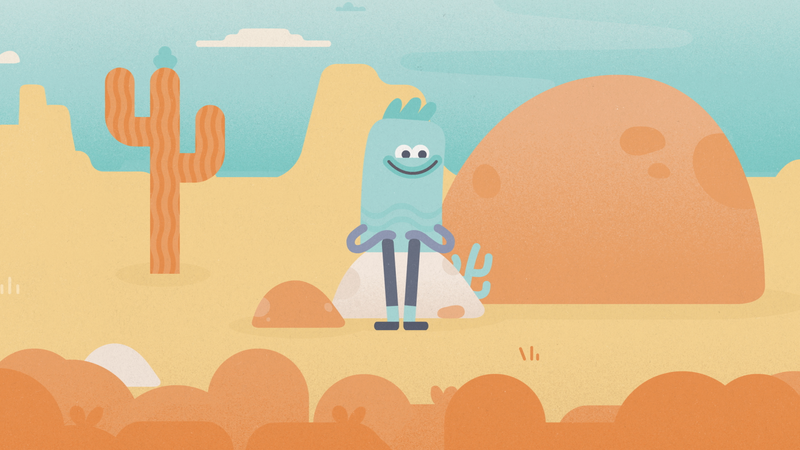 So, I thought it would be great if we could do one of Headspace’s three minute mini-meditations all together. Don’t be scared if you’ve never done it before. All you have to do is sit there and listen to what Andy says. (I’ll tell you a little bit more about who Andy is later on.) Best part is, I’ll be up here doing it with you! There’s no wrong way to do it. Video: Take a moment to sit comfortably. And when you’re ready, just taking three nice big, deep breaths. Breathing in through the nose and out through the mouth. As you breathe in, that idea of taking in fresh air, the lungs expanding. And as you breathe out, just noticing how the muscles in the body soften and relax. And with your third out breath, just gently closing the eyes. And just feeling the weight of the body pressing down against the chair. And as you pause, just still for a moment, just noticing the movement of breath in the body. Notice where in the body you feel that rising and falling sensation. Can’t feel anything, you can just gently place your hand on the stomach. Some people feel it around the chest, the shoulders. For other people it’s the diaphragm or the stomach. There’s no right or wrong place to feel the breath. Just noticing where it is. And starting to notice the rhythm of the breath. Whether the breaths are fast, slow. Whether they’re deep or shallow. Nothing to do, not breathing in any special way. Just following the natural rhythm of the breath. Noticing when the mind has wandered off and gently coming back again to that rising and falling sensation. And when you’re ready, just gently opening the eyes again. All right. Thank you for doing that with me. How did that feel? Does anyone feel better? Does anyone feel worse? Was that really hard? Meditation is hard! At least at first. And it doesn’t always feel good. And that’s the real challenge. Sticking with something that doesn’t feel good it until it starts to. So that’s really what my job is all about. Helping you through it until it feels good. 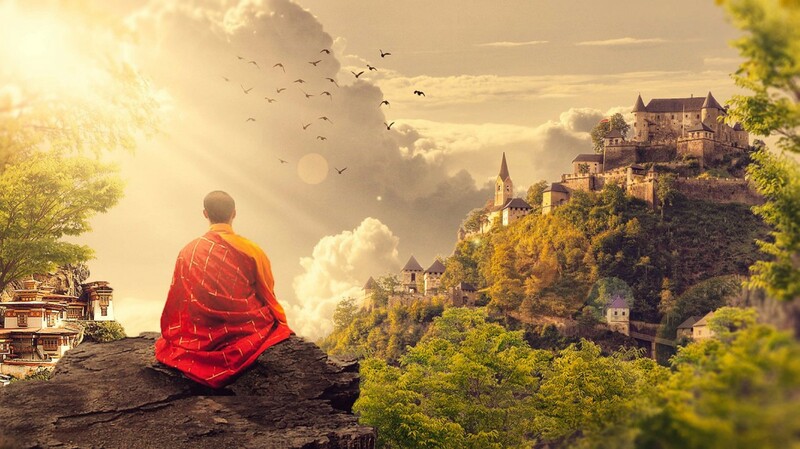 Andy made unexpected decision to travel the Himalayas to study meditation. 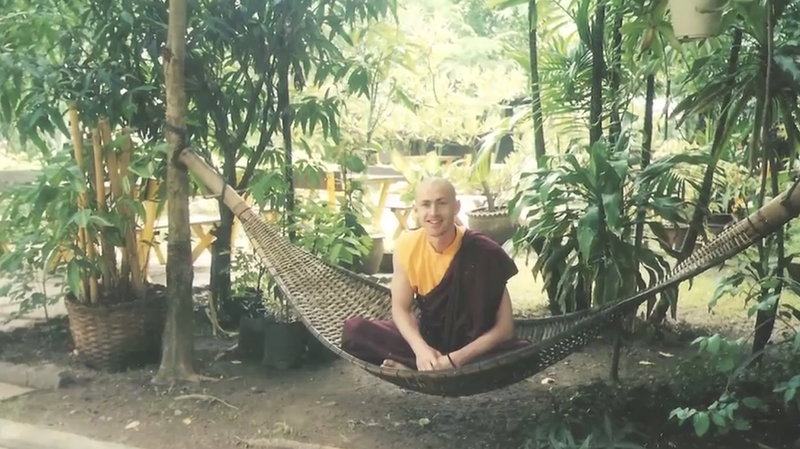 It turned out to be the start of a 10-year journey which took him around the world, culminating with his ordination as a Tibetan Buddhist monk in India. It was out there that Andy had learned that the East had figured out something that the West desperately needed. So, he went back to London and opened up a clinic teaching meditation, and there’s where he met our other co-founder Rich (he’s the other guy, not the bald one). Rich had gone in to see Andy because he was very much like some of us in this industry — stressed and so busy all the time. Together, they had the idea to start hosting meditation events where they could teach many people at once about meditation and mindfulness. 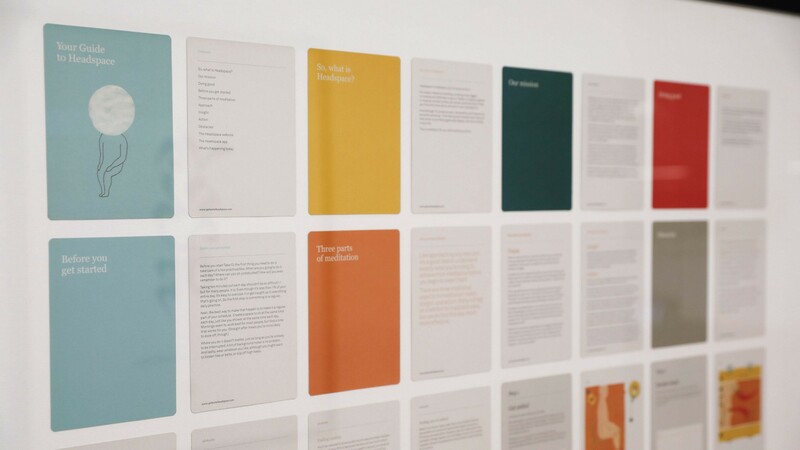 In some ways, the very first version of Headspace (the product) was actually these cards that they handed out at the meditation events. The cards taught you how to sit, how to breathe, and how to meditate.You can even see our original logo in the first card — that’s where our iconic orange dot from. 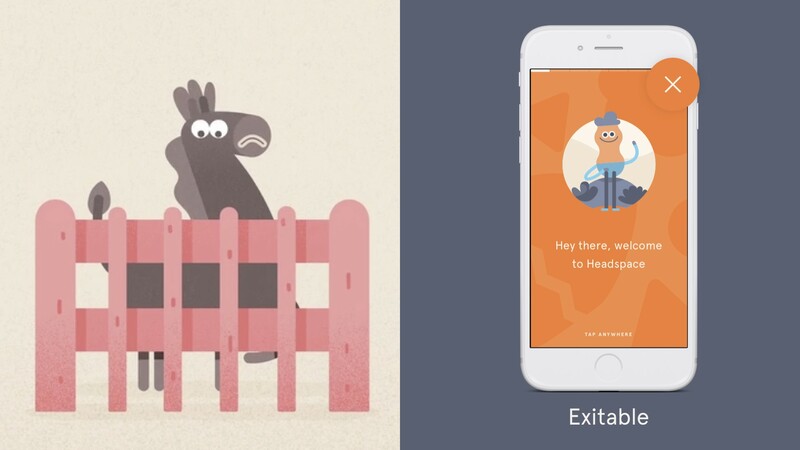 Fast forward a few years and a few app versions later… and we get to the Headspace you see today. We recommend everyone start with “The Basics”, which are 10 introductory sessions that are free for everyone. 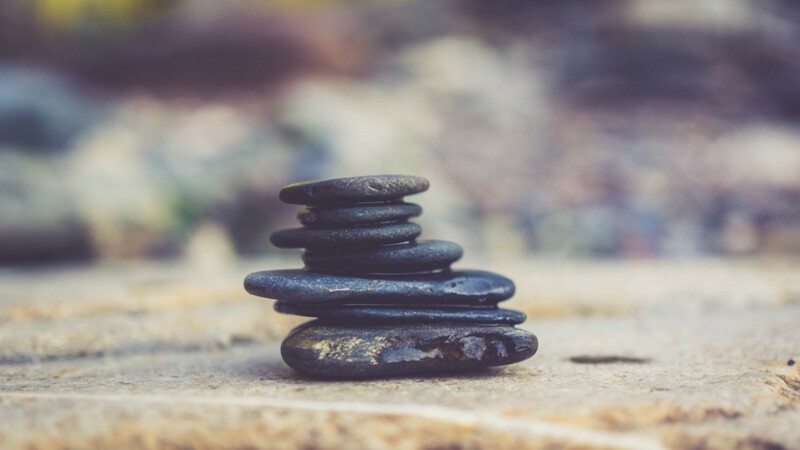 You can also try a shorter mini meditation if you don’t have as much time. (That’s what we all did together just a few minutes ago.) And if you want to go deep on a topic, we have specific courses for things like Sleep and Stress. So, I just gave you a bunch of context. 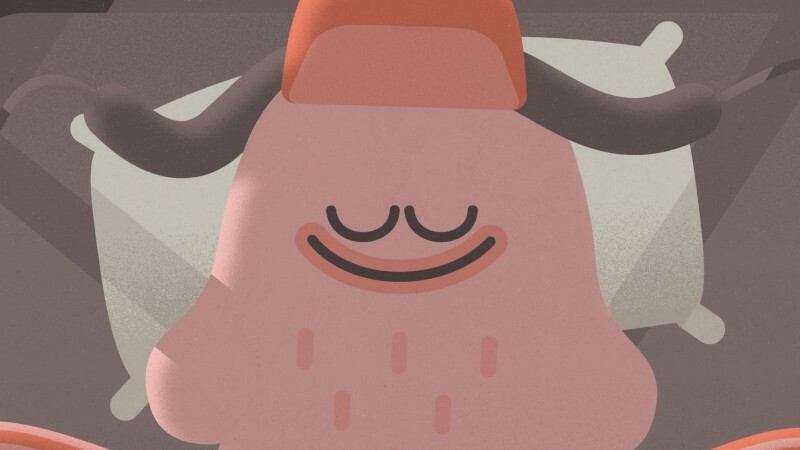 I demystified meditation a little, I explained who Andy is, and told you a little bit about how the Headspace app works. 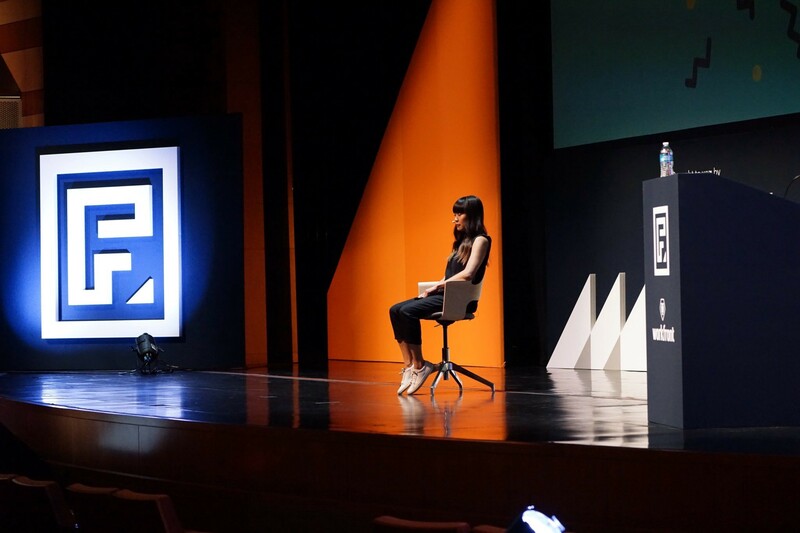 Our challenge, in moving from in-person events to a digital product, was doing exactly that — on your phone — with much less time and much less attention. Now, I’m going to walk you through a case study about our onboarding redesign, but this story is really about us as human beings. And how we have this special ability to make connections and fill in the gaps. By the end of this talk, I hope you’ll understand the power of other methods of reasoning, aside from data, that can inform how we make decisions and how we design. First, I’ll start where we started about 6 months ago — with data. 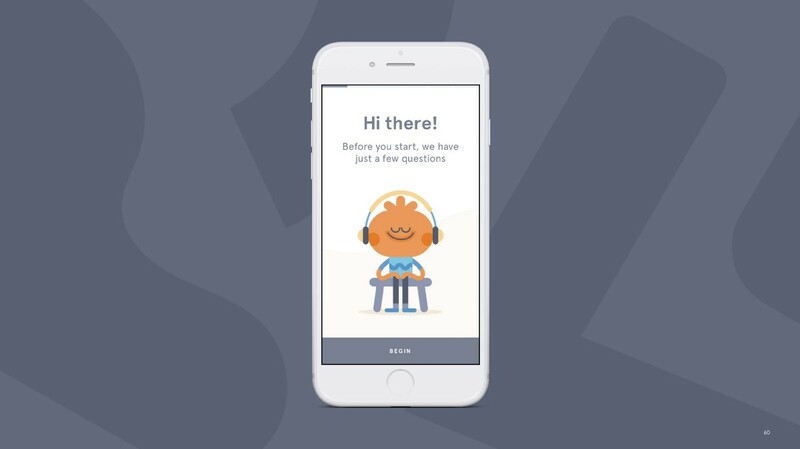 This was our original Onboarding flow — if you joined Headspace anytime before the last few months, you would have seen this. Along the left you’ll see the % users that reach each step, and along the bottom the % drop-off at each point. We begin by welcoming and reassuring new meditators that we’re here to guide them. We see a small amount of drop-off on each of these warm-up cards. Next, we ask them to watch an animated video to help them learn the basics about getting set up, finding a quiet place to sit, and so forth. Here we see a bigger drop-off, and many more users just skipping the video. 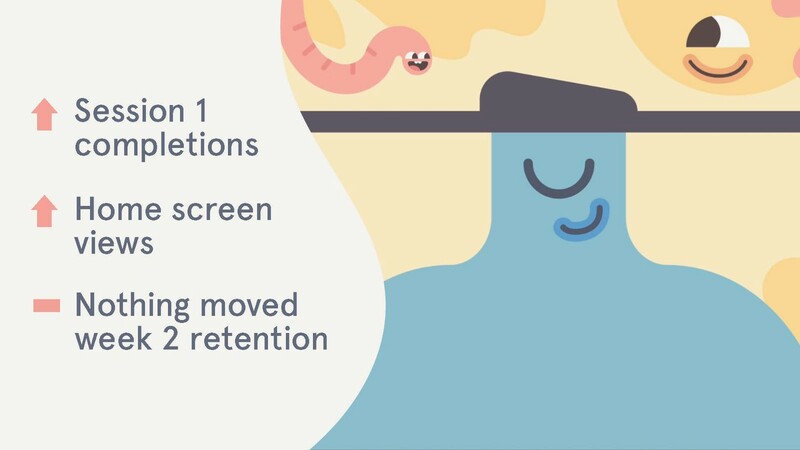 One more warm-up card, and then we ask new users to jump right into their first meditation — where about about a third don’t even begin, and more than half who start the video don’t finish it. 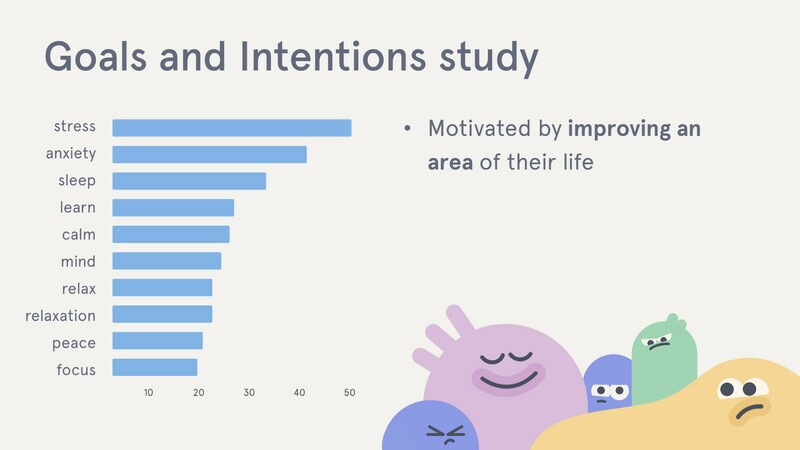 This leaves us with about much fewer than half of new users completing their first meditation session during onboarding. 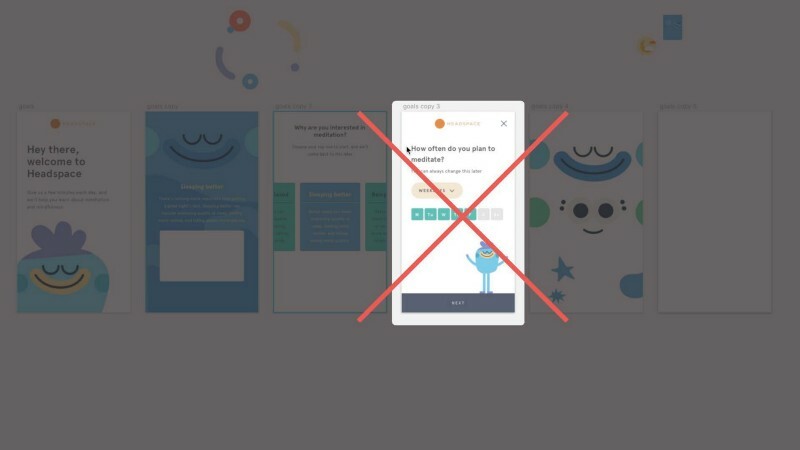 So these onboarding percentages are the # of users who reach certain points in the flow (which is nice to know), but what we really care about are the number of users who actually come back to meditate in the weeks after. Here we’ve got less than half of users meditating during that onboarding session. Over the course of week one we see another half as many more come back, so there’s something going on there. But by week two we’re seeing this huge drop all the way down to less than half! And in the following weeks incremental drop-off. It looked like something was something happening here in week two. We saw that those users meditating in week two were much more likely to convert to a paid subscription. Improving this number seemed like our biggest opportunity, so it became our north star metric, and that’s what we’ll use to measure success going forward. So great. We had all this data. We knew our users were dropping off. We set off to redesign the onboarding. What could go wrong? Our first hypothesis based on the data was that users were annoyed that we were blocking them from exploring the app. So we tried an experiment that simply made the onboarding exitable by adding an “x” to every screen. Another hypothesis was that users weren’t excited about watching instructional videos. And if they were skipping videos, it meant they weren’t getting all the useful information about how to get set up. So we created a flow that just had a series of animated gifs that contained all of the info from the video, but in a much shorter and engaging way. Our next hypothesis was that users didn’t all want be to be onboarded in the same way. Maybe some wanted to explore the app or meditate, and maybe some did want the onboarding instructions. 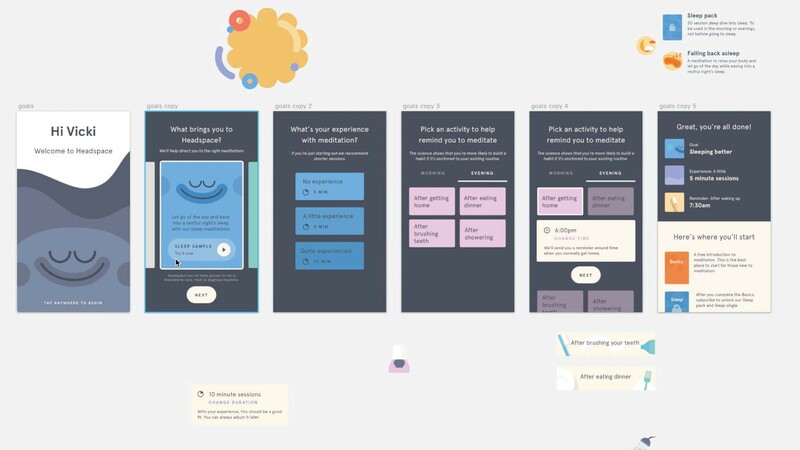 So we created an interstitial screen that let new users “choose their own adventure” for what to do first: meditate, get set-up, or explore the app. And our last hypothesis was that maybe users were getting impatient and leaving because it was taking too long for their first session to download. On a slow connection, this could take up to a minute. 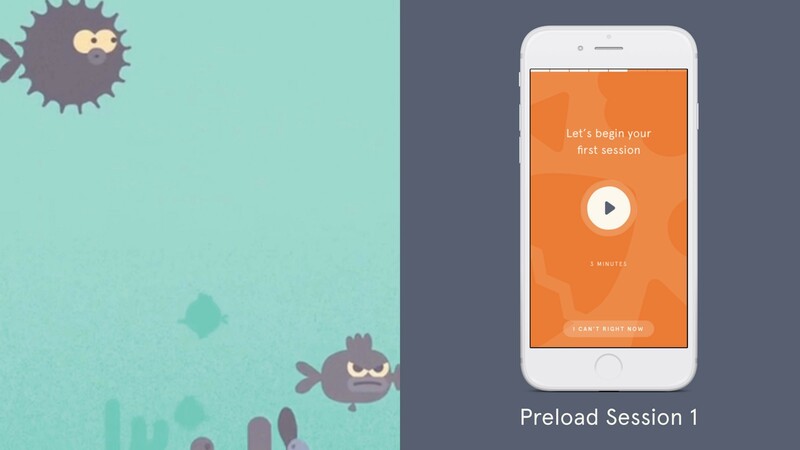 So we tried preloading session 1, by bundling with the app download, so new users would be able to play their first meditation right away. After we shipped these experiments, we monitored the numbers closely — and the early numbers were promising! 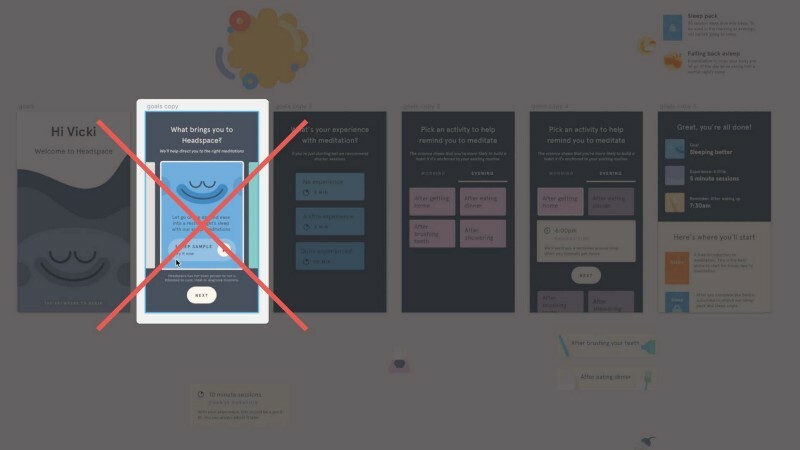 With the animated gif flow, we saw more users completing session one, and by making onboarding exitable, we saw more users getting to the home screen and we hoped that meant they were exploring the app. However, these metrics, which we call “leading indicators” are sometimes correlated, but can also result in false positives. In the end, none of these experiments moved week two retention. And that’s the limitation of data, right? It’s backwards looking — it can only describe what has happened but you can’t use it alone to prescribe solutions. We were designing based on assumptions rather than underlying user needs. We decided to take a step back to really figure out why users weren’t coming back. 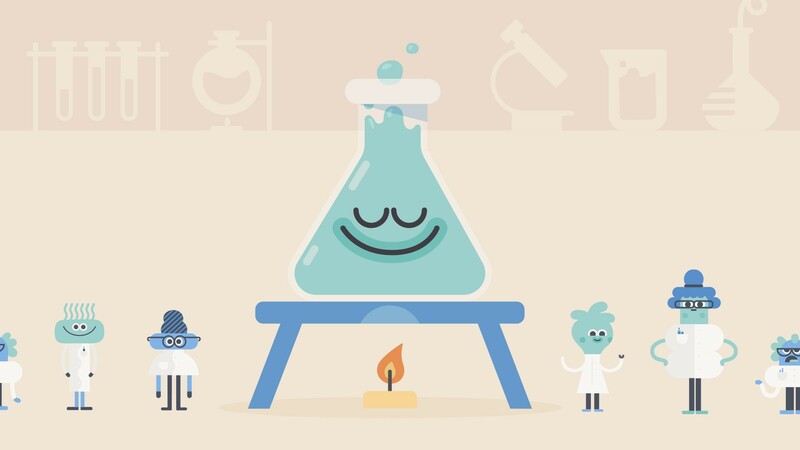 At Headspace, because we see meditation as both a practice rooted in ancient history (like what Andy learned in the monastery), and a topic of modern science, we are lucky enough to have something that a lot of companies don’t — a Science team! This sounds like a really simple question, but it was something we had never explicitly asked before! The graph on the right shows the results of a word cluster analysis we did across all ~50 participants’ freeform responses. You’ll see things like stress, anxiety, and sleep showing up a lot. New users find value in simply being asked about their goals because it helped them articulate and clarify their purpose for meditating. 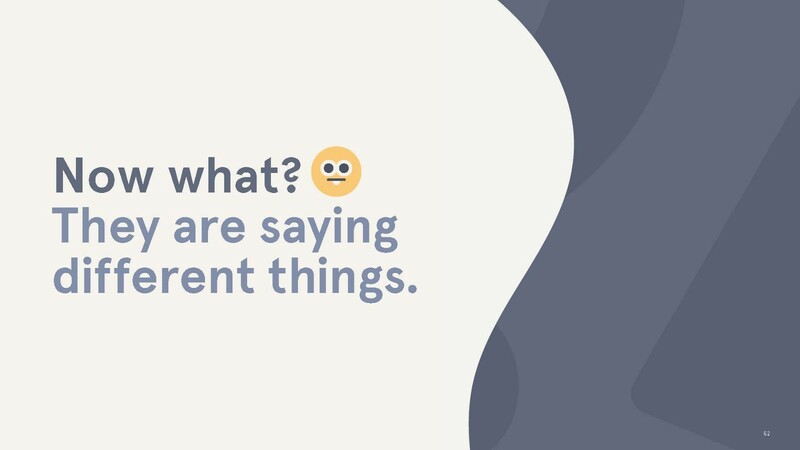 Again, this may sound obvious but because many users come to Headspace via a friend referral or word of mouth, they haven’t necessarily thought through what they want to get from the app. In this way, simply taking the time to stop and reflect on their goal was really helpful. 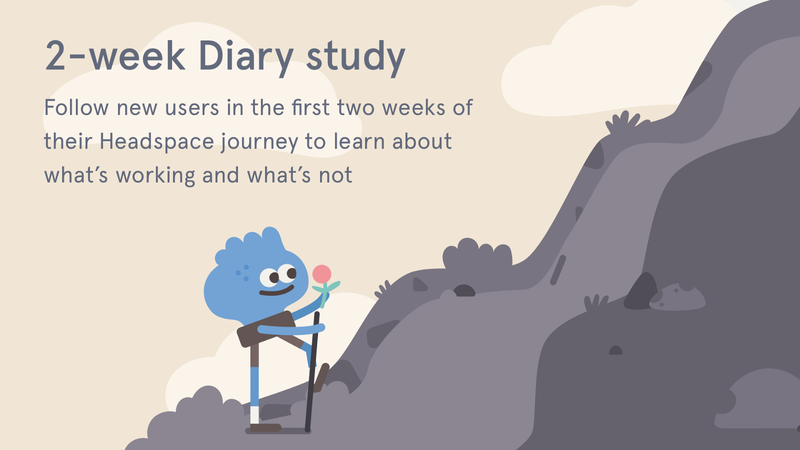 Our Design Research team also ran a diary study looking at new users in the first 2 weeks of their journey. 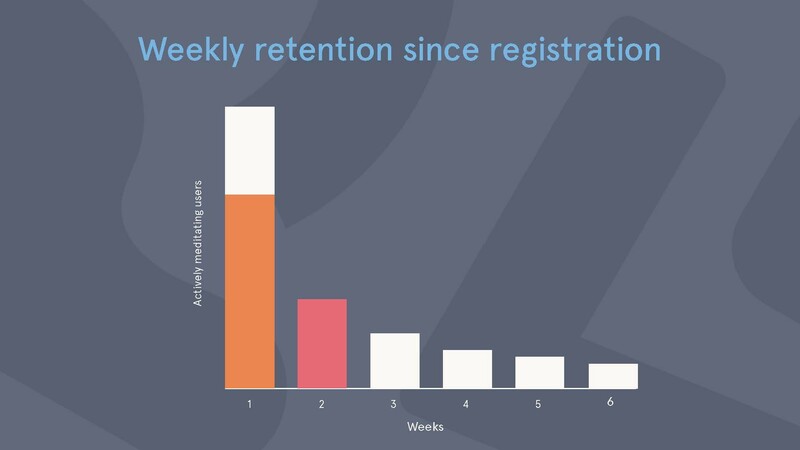 Remember that metric that was so important — week 2 retention? We wanted to follow users during their first two weeks to better understand what was working and what wasn’t. When/where/why do they meditate, or not? What are their main obstacles? What questions do they have? What results or benefits are they expecting? From this study, we learned a lot of interesting things! New users need a lot more guidance than we’re providing. In particular, they want more reassurance as they’re settling into the practice — are they doing it right and when might they feel better? For those of you who aren’t familiar with the habit formation loop, I’ll use an example of something hopefully we all already do every morning and night — brushing your teeth. And over time, you might make an investment in an nice electric toothbrush, and every time you use that nice toothbrush, your teeth feel even cleaner! When we mapped what we heard to this framework, we saw that we were lacking in every step. 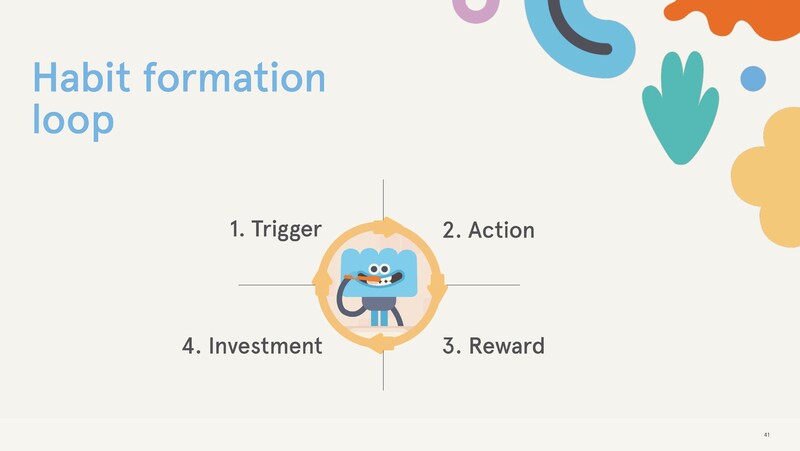 We came up with four new hypotheses that targeted each step of the habit formation loop. These hypotheses were rooted in user needs, in contrast to our original data-driven hypotheses around removing friction. Our first “new” hypothesis was that creating intrinsic triggers would motivate users by relating their meditation practice their goal. For example, maybe your goal is to have better, more restful sleep. If we asked you to set this goal and we reminded you of this goal when it came time to meditate, you might be more motivated! So, by asking new users to think about their goal for meditating, we hoped this would motivate them to meditate when the time came. When and how much they should meditate to start. What time of day? How many times per week? And, for the reward step, we thought we could set realistic expectations about when they would feel better. Does it take a week, a month, a year? And last, we knew we had to to help users find time in their routine so they could really invest in the product, whether it was in the morning when they brushed their teeth, or after work when they got home. Equipped with strong user-driven hypotheses, we started to work on the new flow. 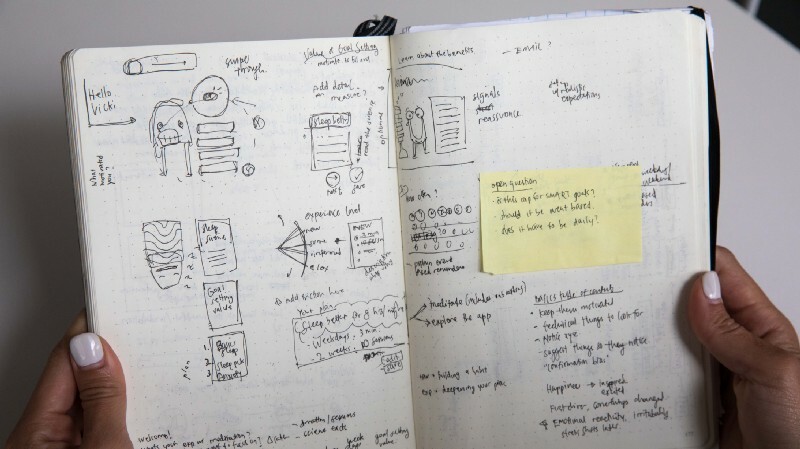 But rather than jump right into designing or even sketching, we wanted to validate these concepts first. 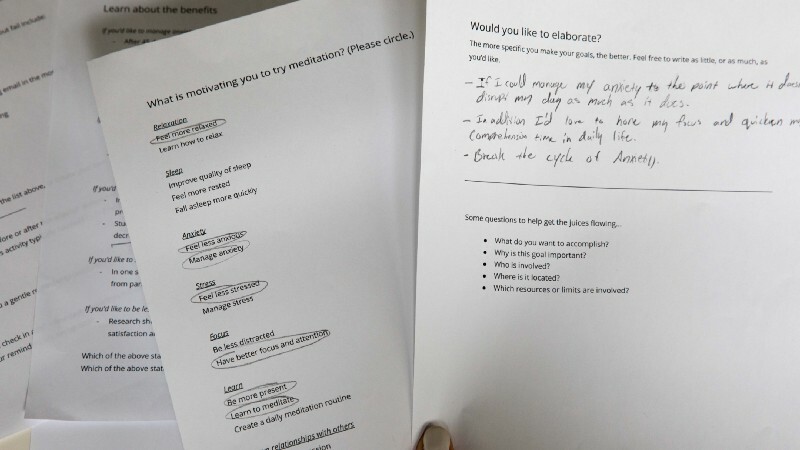 The first few rounds of user testing, we simply asked users to fill out worksheets and circle options for what motivates them to meditate. We had pulled the options directly from the Science “Goals and Intentions” study, and asked them to elaborate on their goals with a freeform writing exercise. These were really helpful to read and talk through early on! 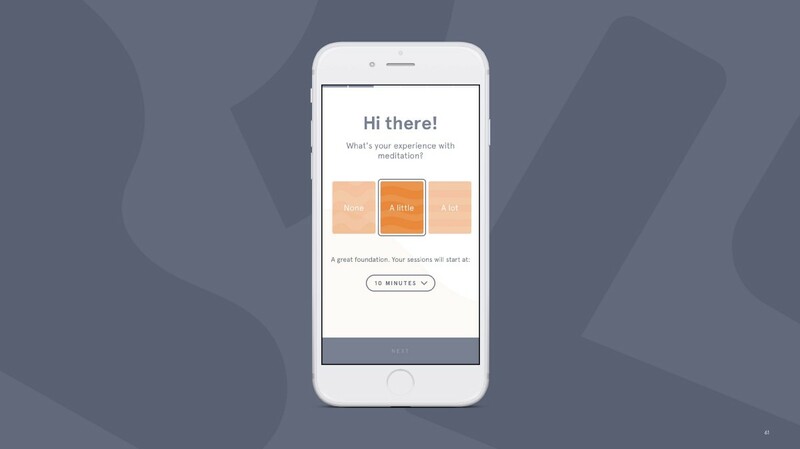 We also asked users to read some science tidbits about the benefits of meditation — we wondered if these would help set expectations for new users. 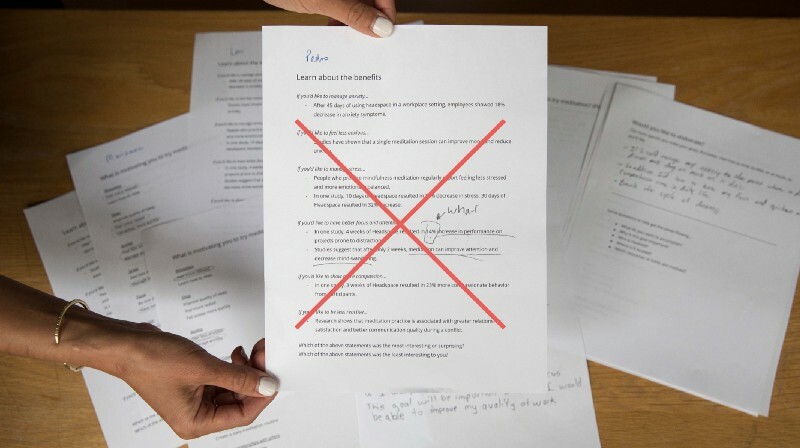 You’ll see here that one participant circled the number 14% — turns out it’s really hard for everyday users to wrap their mind around what a 14% increase in performance, or what an 18% decrease in anxiety looks like. What we found out was that these science facts were very polarizing. For some users, they really resonated. For others, they got stuck on the details. Then, I got started sketching out the flow, trying to find a way to give structure to our science-based hypotheses. The early bits of ideas included a sections around setting goals, education around the benefits of meditation, asking about their experience level, and setting a schedule. This would all then output into a “plan” for a new user’s meditation practice, something like a roadmap for your meditation practice. As I brought this into Sketch, we continued testing every week or so. But other users felt that it was too early to be asking. Considering they hadn’t even meditated yet, it was really hard for them to know. But we also heard from others that listening to a snippet of a meditation disrupted their flow of getting set-up. After hearing the sample, users expected to just start meditating from there. 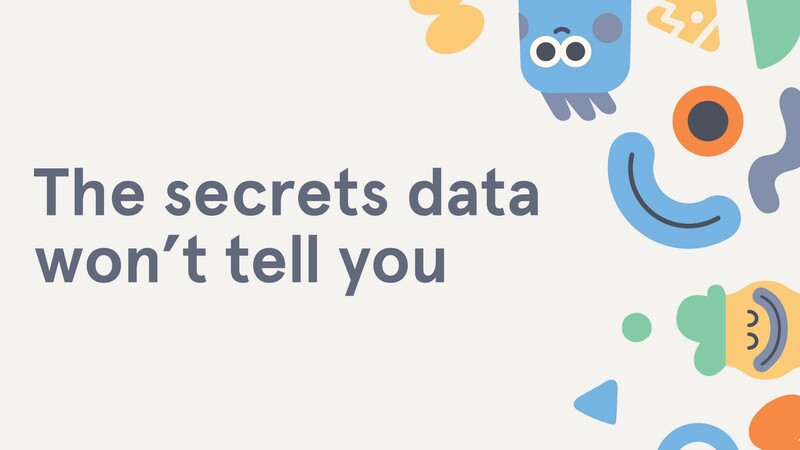 So we had our data, we had done our research, but users were telling us conflicting things. What were we going to do? Well — more often than not — even with all these tools, decisions have to be made with incomplete information. On top of that, in start-up environment, time is a limited resource. 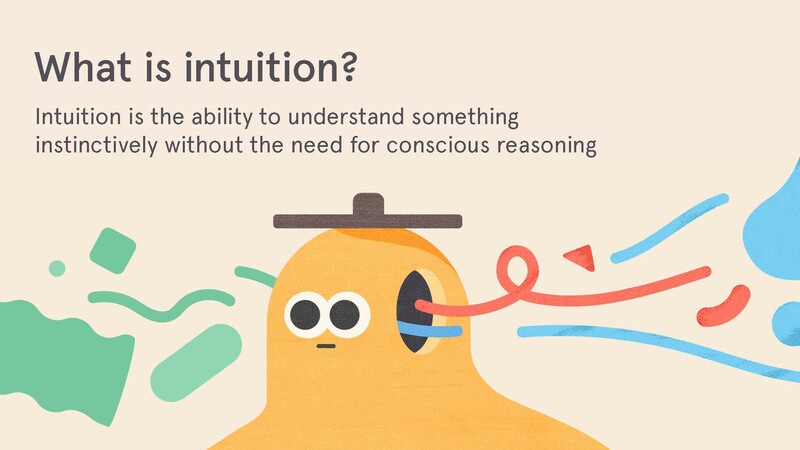 There’s a new meditation app popping up just about every day so we have to be comfortable making decisions with limited information — and that’s where intuition comes in. Remember that thing that I said was special about us as humans? That’s intuition. Intuition helps us fills in those gaps, allowing us to move faster. 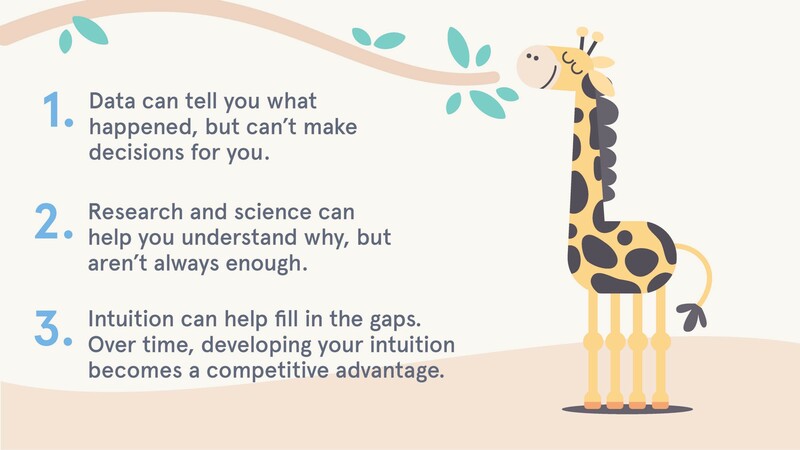 You might be wondering: What is intuition exactly? You might have a vague sense of it, as that thing you use as an excuse when you can’t exactly explain something, but you know it to be true. 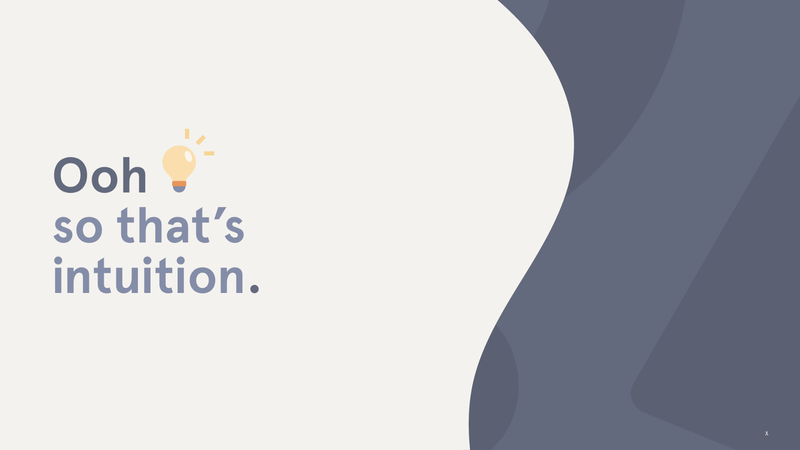 In this case, intuition helped us simplify complexity. We decided to leave the “meditation frequency” question out of the flow. If you’ll remember, some users thought it was way too early to set a schedule before even meditating. 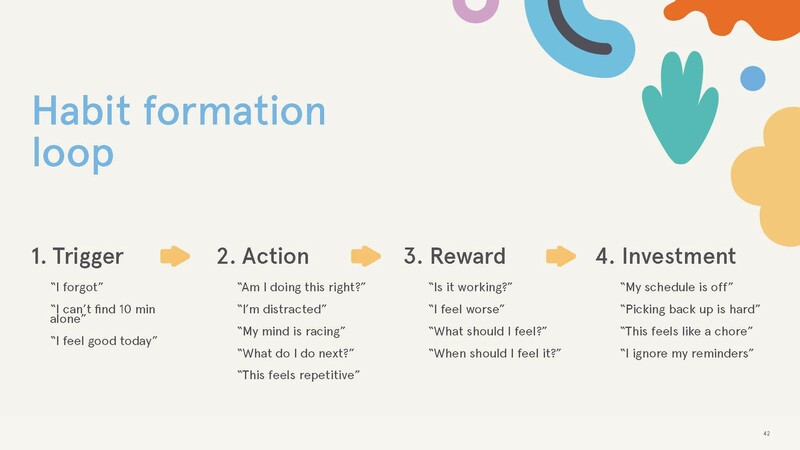 Instead, we leaned on the habit formation loop and decided to instead help users create healthy new habits. Rather than “sell them” or “educate them” this early, we decided that it would be best to set this expectation later on, after they had tried their first meditation. Intuition also guided us to remove the sample meditation, even though some users liked hearing Andy’s voice and it made them to want to meditate right away. If you’ll remember from the original data, we saw that Session 1 completions weren’t necessarily connected to week 2 engagement, so we decided to focus instead on helping them get set up. So, intuition becomes this compass that can help us navigate uncertainty. In the context of design, intuition can take the form of a non-rational pull that takes us on a different path, or an incongruous idea that leads us to a surprising conclusion. This process of listening, extracting, and understanding is where the real magic begins. And the more we repeat this process, the more we can build and develop our intuition. And over time, this skill becomes a competitive advantage because we can make decisions and move faster. Now I’m going to walk you through the details of the final flow. First, we start with a warm welcome, setting some context for what’s to come. Then we ask about your experience with meditation. We recommend different durations based on experience, but you can always change your duration if you’re a new user who wants longer sessions, or vice versa. Next, we ask about your reasons for coming to Headspace. We took the data from Goals study and the Week 2 study to find the top six reasons. 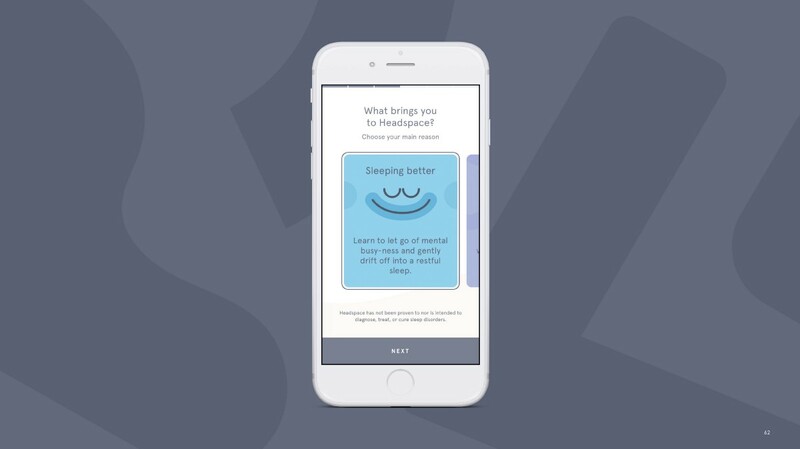 The expanded card view gives a little summary about what Headspace has to offer on each of these topics. From behavioral science, we know that the best way to create a new habit is to anchor it to an existing one. 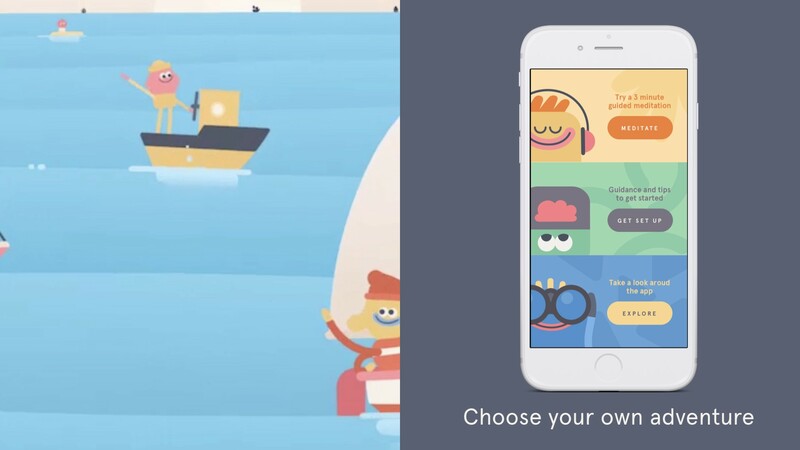 So we then ask users to choose a “habit anchor” like eating breakfast or brushing their teeth. 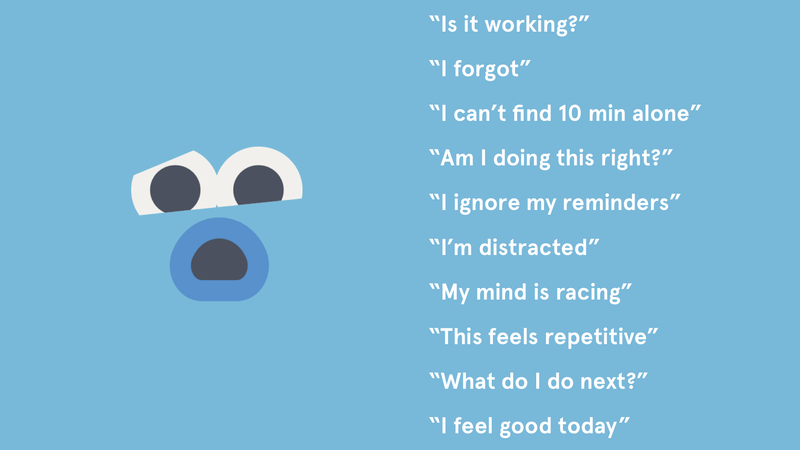 Over time, we hope that the existing habit is enough to remind you to meditate, and we can phase out the actual push reminders. It took us about 6 weeks to design and build this MVP experience, and what we saw was a significant increase — about 10% relative increase in week 2 retention! In addition to that, we also saw an increase in conversation rates over a user’s first 90 days. 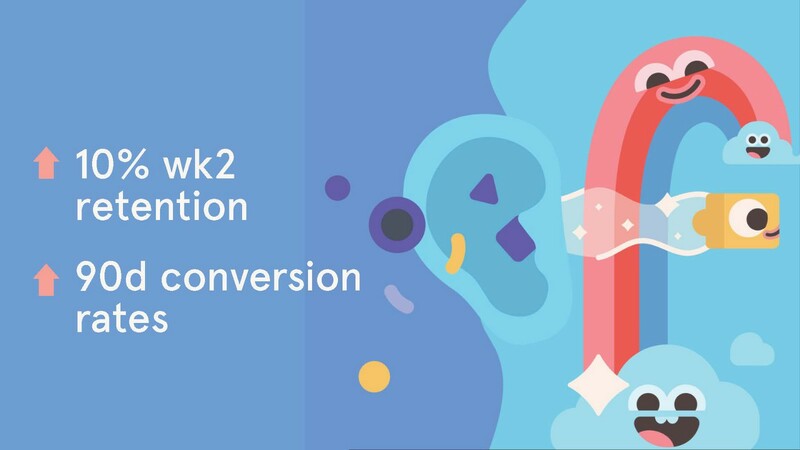 If you’ll remember from earlier in the talk, one of the reasons we cared about week2 retention is because it’s a leading indicator for conversion rates, so it was nice to see that that went up too. So this was great. We had moved our north star metric and grew the business by actually helping users! Data helps us understand the past but it doesn’t make decisions for us. It can help us identify opportunities, like that huge drop in week 2 retention, but alone, it can’t prescribe solutions. User research can help us understand why, and behavioral science can provide a good frameworks for us to base our solutions on, but what users say can be conflicting, and sometimes they don’t know what they want or there’s not enough time to do more research. This is when we lean on intuition. Decision making is at the heart of what we do, as designers. We’re all just trying to take the information available to us and make good, quick decisions. Intuition helps us do that. If you are intentional about how you develop and grow that intuition, it can become a competitive advantage for you, your team, and your company. Light sleeper, heavy dreamer. Product design @Headspace. Previously @Lyft, experiments @Google, research @Stanford.